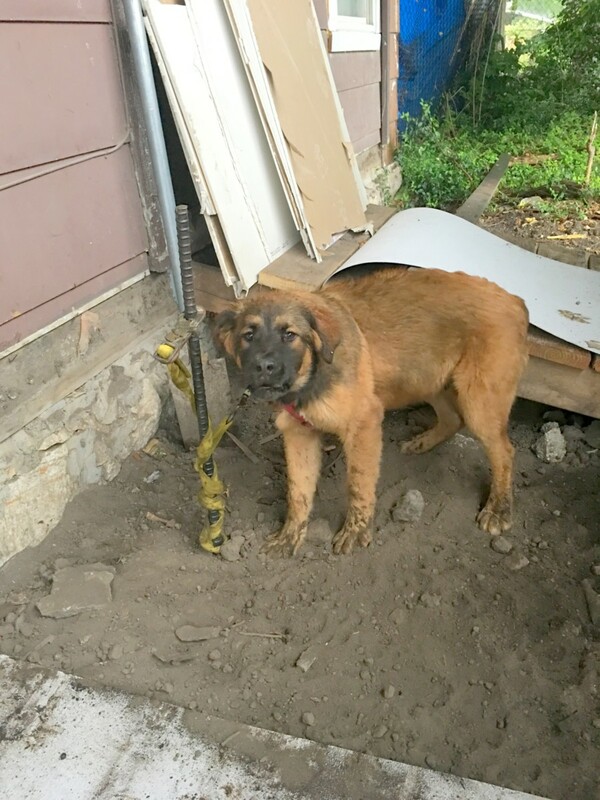 You might remember a couple of weeks ago when Chain of Hope rescued Cordy and Dahlia from being tied to poles with leashes their first 6 months of their lives. The place where they were was an auto junkyard, which was surrounded by a privacy fence. If you remember, we were able to get 2 of the little puppies that were here back in January. Molly, the momma dog, had given birth to 11 puppies in late November. The people at that time would only give us 2 of them. We put them in a foster home and they were eventually adopted. While we were there, I asked about the parents again. We had never gotten to see them-the privacy fence gate was always closed and it was a pretty big junkyard. The neighbor, who was the only advocate for these babies, said that they were still back there. She said they were not in a good situation. She told me that the guy that owned the junkyard was going to give Molly, the momma dog, to someone and he was also taking Moose, the daddy dog, somewhere else. We had offered to spay Molly for free after her last litter, but the man declined and said he wanted her to have another litter. It is so maddening out there-we just want to scream sometimes. We took Cordy and Dahlia, the 6 mo. old puppies that day. I asked her if we could go back there and see the parents and because the guy was not there at that time, the neighbor took us back there. It was a hell hole. These 2 dogs were in terrible circumstances. You can’t tell in the one picture with the big male, but his dog house only had 2 sides on it. He was absolutely drenched in the rain. Momma had some kind of plywood thing set up, at least she was dry. This was all pathetic. The neighbor told me that she had gotten onto the guy about the dogs. She told him that he’d better do something with them or she was going to-they couldn’t live like this. He told her again that he was moving them. He never did. Look how they were living. This angel neighbor called me a couple of days later and asked me if we could take the parents. Of course, we’d been thinking about how we could get them out of there. She said she had given her last warning to this guy and he simply would not step up for these dogs. I told her we were so very full, we wanted to help but we needed to know their temperaments, if they get along with other dogs, etc. She told me she was putting them in her truck and asked if I could meet her at the park up the street. I did. We got the momma dog, Molly, out and she was great. This woman had Moose tied in the car because he was coming over the seat, etc. and he weighed about 100 lbs. He seemed pretty wired, but he’d been living on a short chain for quite awhile. I thought they were both wonderful! They were awesome dogs and they liked each other. I told her that I had to go back to Chain of Hope and rearrange some dogs and prepare to take these two in. I told her I needed a day to get ready for them and asked her if they would be alright for one more night. She assured me that they would be. I told her we’d touch base the next morning. She told me she was taking them for some ice cream-she’s a wonderful person! Their angel! The next day, Tanner and I went to meet this girl again to get the two dogs. I definitely wanted Tanner there to handle Moose-he was huge and very strong! It was a very hot day and the dogs were thirsty. We watered them and then loaded them up to head to their new lives at Chain of Hope! 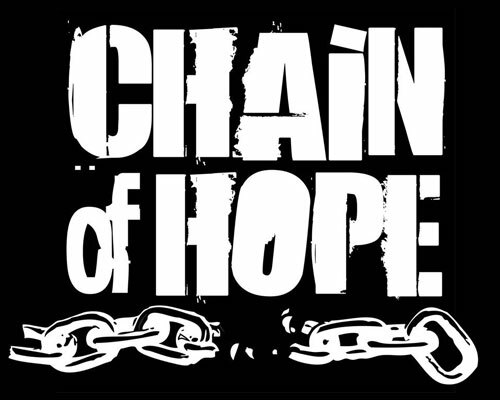 We got these kids back to Chain of Hope. They are amazing dogs, both of them. How they are such great dogs after living how they were living and being treated how they were being treated is beyond me. They are happy, play very well with other dogs, they listen well, they are crate-trained-they are just great dogs! They are very happy at Chain of Hope, but of course, would love to have a forever home with lots of love. They deserve it. What humans do to animals is just so sad. These two have incredible spirits and so much love to give and they were sitting out there on their chains in the thunderstorm, uncared for and forgotten by everyone but one compassionate neighbor. We are extremely grateful for what she did for these dogs. We are so grateful for people who make that call to help an animal in need. It just takes one person to change the life of an animal that’s been waiting for help. This young woman had a heart of gold. It’s because of her that these 2 fabulous dogs are now safe at Chain of Hope. Look how happy they are! To apply for Moose or Molly, please go to www.chainofhopekc.org and go to our adoptable pets page! Thank you, supporters, for keeping us out there!